I sort of knew it would happen, expected it to happen. 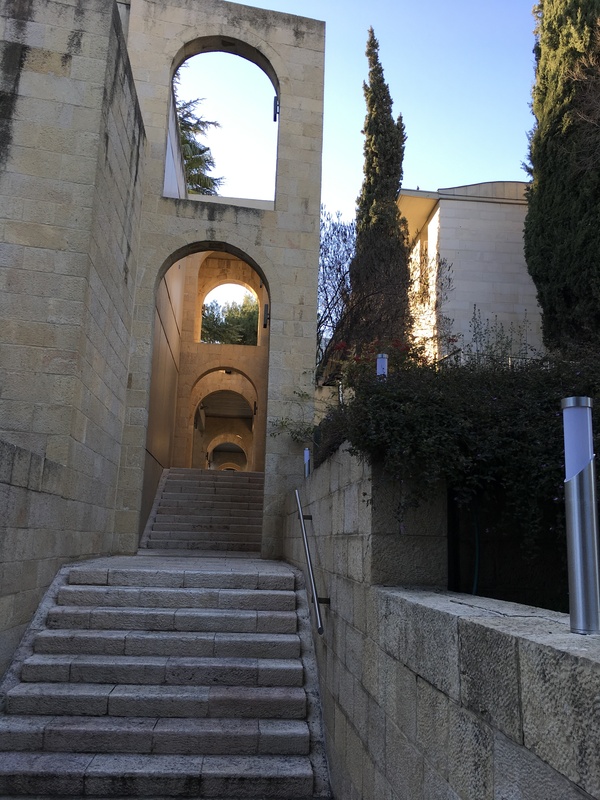 But even so, it felt like surprise, not inevitability, to run into people I knew in Jerusalem. 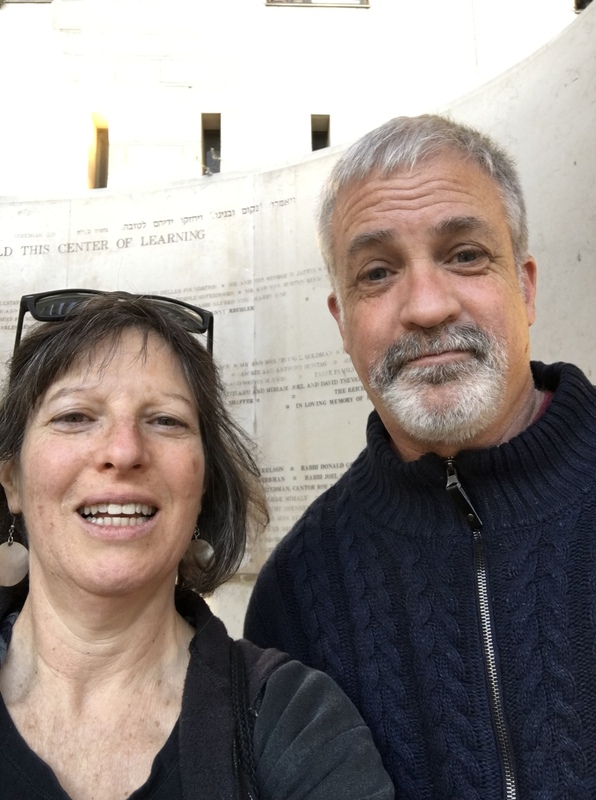 Yesterday it was Rabbi Rich Kirschen while I was wandering around the beautiful campus of Hebrew Union College, where I’d spent my first year of rabbinical school. We had known each other during rabbinical school in New York but mostly from when we’d both lived in Park Slope, Brooklyn. He works for NFTY, the Reform youth movement, in Israel. Today it was “Captain Sunshine” solar energy pioneer Yosef Abramowitz, married to my friend and classmate Rabbi Susan Silverman. Knowing I wouldn’t get to see Susan this visit since she is in the US, Yosef and I had made tentative plans to see each other at synagogue services tonight, which ultimately wasn’t going to work for me, since I will be visiting my friend Bili’s parents outside the city for Shabbat. So, voila, the magic of Jerusalem abra-kadabra’ed a serendipitous meeting while buying fruit and vegetables before Shabbat. 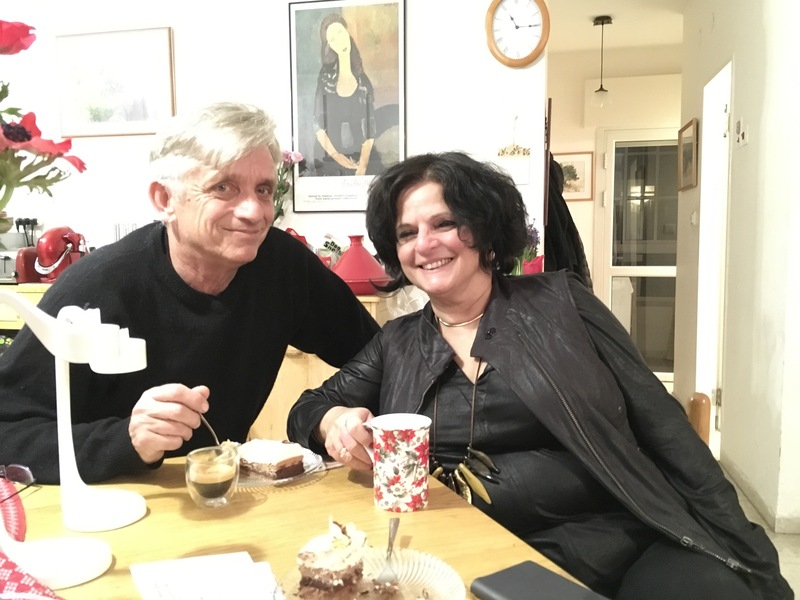 Bili and her husband Mats, eating his birthday cake! Happy Birthday, Mats! In the Jewish School, we spoke about Jewish ritual objects which the kids had brought from home, and in the Arab school, the kids had prepared presentations about Jewish culture, such as Jewish garb, Jewish food, etc. In both schools I got to practice my Hebrew, and they all got to meet a woman rabbi. A win-win for all. Plus I then got to eat the famous Abu Ghosh hummus over lunch with Simon. 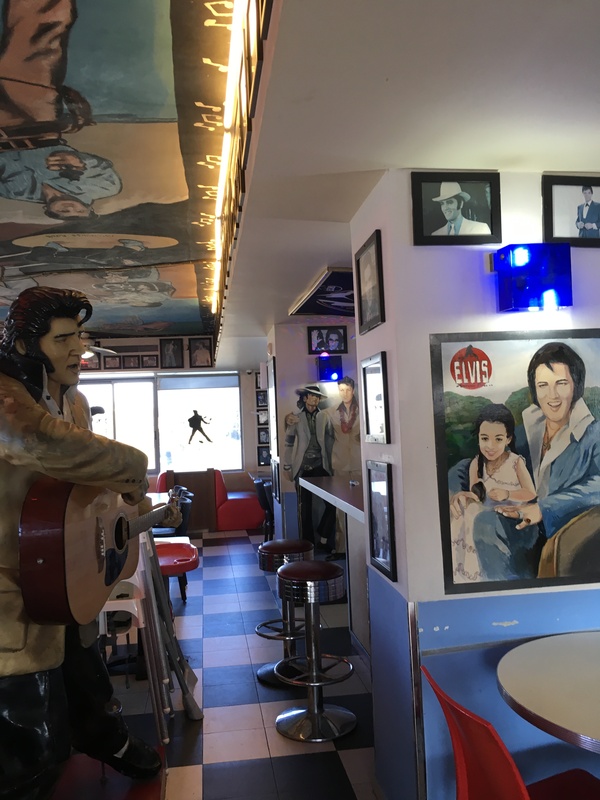 We also visited the wild and crazy Elvis Diner outside of Neve Ilan, owned and run by a big Elvis fan. Simon also took me for a tour of two Arab villages, Ein Nakuba and Ein Rafa (where everyone seemed to know him) and explained the cultural differences (one is more traditional, in which the daughters marry early and don’t get educated) and history of each. If you want to read more about the real impact of CCECH’s work, this article about what Simon accomplished in these two villages (and why they all know him) will warm your heart and perhaps spur you to make a donation to support his educational co-existence work. 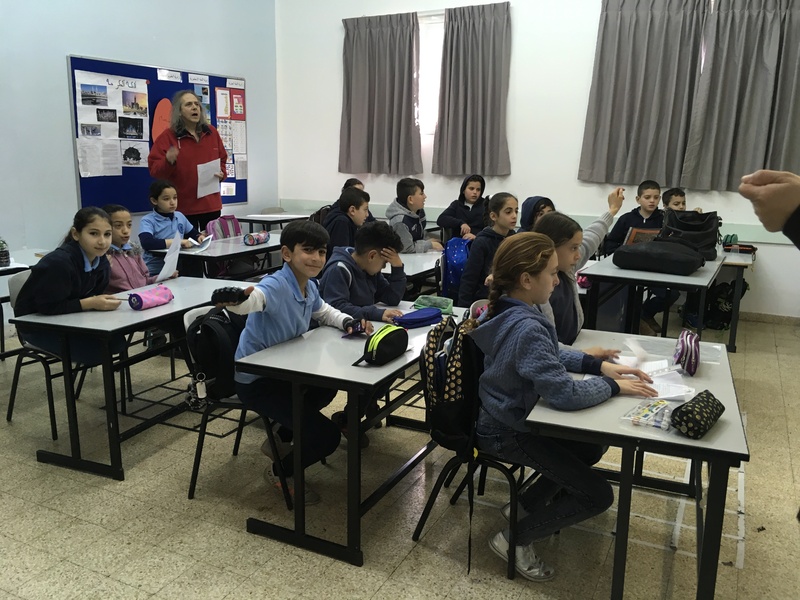 The class of 5th graders in Abu Ghosh; Simon standing in the back. More to come; I’ll be in Israel for almost a month. Shabbat shalom! We send you very special greetings on your birthday. We have also arranged this concert so that your event can be celebrated by some titans of musical composition. PS Our Rabbi Mark Kaiserman will also be in Israel this month.